The order direction, review and publication of scientific articles. 1. The order direction of the articles for publication. 1. Article prepared by the authors in accordance with Requirements to the articles 2016 submitted in electronic form to the e-mail vestnik@srd.vsau.ru or to the editorial board – Voronezh, ul.Michurina, 1, aud.111, Leonova Natal’ya Viktorovna. 2. The editors check the article on the original text, eligibility for formatting and direct to the journal experts from each faculty. 3. The expert approved by the Dean of the faculty, evaluates an article on the relevance of research, scientific novelty and significance, logic of presentation. If necessary, the expert creates comments, recommends amendments to the articles, which are sent to the author. The article is accepted for publication only after the consent of the expert. The expert may prepare a review of the article, if during the last 3 years has published papers on the subject of the reviewed article. 4. After the peer review editorial Board conducts if necessary a final correction of the article (aud.111, Gribanova N.M.) and send to print in accordance with the queue (for foreign authors after signing the contract on publication of the article and paying publication). The articles must be related to the agribusiness issues. The editorial Board accepts only previously unpublished materials, the responsibility for correctness of information and for complying with copyright entirely borne by the authors manuscripts. The volume of the article – 4-20 pages. Manuscripts should be carefully checked and edited, the text must be clearly and consistently set out. Font, paragraph, Times New Roman, size 12, single spacing, paragraph indent 1,25 cm, justified alignment, margins: left, right, top, bottom — 2,5 cm (A4 format). 1. The presence of UDC in the upper left corner without indention. 2. Name lowercase letters in Russian and English languages. Information about each author should be written on a new line. 4. The summary in Russian and English, prepared according to GOST 7.9-95. The volume of the summary of 200 to 250 words, no more than 2000 characters with spaces. The summary follows the structure and logic of the article. The summary contains a factual account, substantiated conclusions (Requirements to summary). 5. Key words (4 – 5 seq., phrases of 2 – 3 words) (Russian and English). 6. Article. Amount sufficient for the full details of the progress and results of the study. The volume of the article – 4-20 p.
Structured presentation (includes introduction, material and methods, results and discussion, conclusions). Drawings (graphic material) should be made in the form of jpg or tif with a minimum resolution of 200 dpi, to ensure the clarity of all the parts (only black-and-white version) and submitted on electronic media. Tables are part of the text and should not be created as graphics. Grayscale images can only be used when absolutely necessary. Tables, figures and equations are numbered in the order cited in the text. Offered for publication article must comply with the basic scientific directions of the journal by field of science 05.00.00 Technical Sciences, 06.00.00 Agricultural Sciences, 08.00.00 Economic science. The articles should be devoted to the problems related to agriculture. Articles must be original, not previously published and not submitted for publication in other journals, the uniqueness of the text at least 75% of the system Etxt and Antiplagiat. Manuscripts should be carefully checked and edited, the text must be clearly and consistently set out. 7. The bibliography (list of references) — at least 10 titles, self-citations — no more than 20% of the list. The list shall be executed in strict accordance with GOST 7.1-2003 (as amended). For each source must be referenced in the text. 1. All scientific articles submitted to the Journal “Vestnik of Voronezh State Agrarian University” are subject to mandatory review. The edition carries reviewing of all materials incoming to the editors corresponding to its theme, with the purpose of their peer review. 2. The edition carries reviewing of all incoming materials to the editor corresponding to its theme, with a view to peer review. Responsible Secretary of the journal determines the appropriate profile of the journal article, the requirements for registration and send it for review to the expert (the doctor, or PhD) having the closest to the topic scientific specialization. All reviewers should be recognized experts on the subject of peer-reviewed material and have in the past 3 years publications on the subject of peer-reviewed articles. 3. The review deadline in each case is determined by the Responsible Secretary of the journal with the creation of conditions for the most rapid publication of the article. 4. The review highlights the following issues: a) whether the content of the article stated in the title of the topic, and b) how much paper is consistent with modern achievements of scientific and theoretical thought in) is available if the article readers, in which it is designed, in terms of language, style, clarity tables , charts, drawings, formulas, c) is it appropriate to publish an article based on previously released material on the issue of the magazine d) what exactly are the positive aspects and disadvantages article which corrections and additions, if needed, should be made by the authors e) recommended that in view of the marked correction of deficiencies or reviewer does not recommend the article for publication in a journal included in the list of VAK. 5. The review shall be conducted confidentially. Author of the article under review provided an opportunity to familiarize with the text of the review. Breach of confidentiality is only possible in the case of the statements reviewer invalidation or falsification of the materials contained in the article. 6. If the review makes recommendations for corrective and finalizing articles, the author of the text is sent to review the proposal to take into account these recommendations in preparing a new version of the article or arguments to refute them. Modified the author of the article re-routed for review. 7. The article did not recommend a reviewer for publication, to reconsider is not accepted. The editors send the authors copies of the reviews or a reasoned refusal and shall also provide copies of reviews to the Ministry of Education and Science for admission to the editor publication prompted. 8. The presence of positive reviews is not sufficient for publication. The final decision on whether the publication of accepted scientific council of the journal and recorded in the minutes of its meetings. 9. After the adoption of the editorial board of the journal of the decision on the admission of article for publication, the Responsible Secretary of issue shall inform the author and indicates the date of publication. 10. 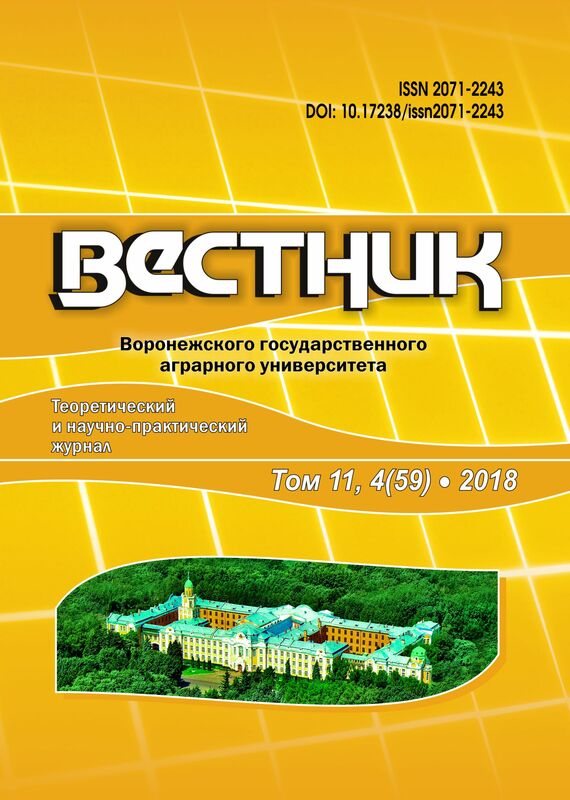 The originals of reviews are stored in the editorial of the journal “Vestnik of Voronezh State Agrarian University” for five years.